I actually don't hate beets, but I have converted at least two people who do with this very recipe. Every autumn, this salad makes its way back into the rotation and onto my table at least three or four times. I don't know why I have it pegged as something that can only be eaten in fall since all of the ingredients are available year-round, but I guess now is the time when beets are plentiful in gardens and farmers markets alike, so now is the time for the "I Hate Beets" Beet Salad. If you do not like beets, please do not pass this one over. Give it a try just once, and if you still don't like beets, well then, I guess you don't have to try one ever again! This recipe is quite quick and easy to prepare, but it does take some advanced preparation, so make sure you start it at least 3 hours before you want to eat it. This recipe was inspired by Jeff Crump's recipe in "Earth to Table" and serves four as a side. 1. Preheat the oven to 400 degrees Fahrenheit. 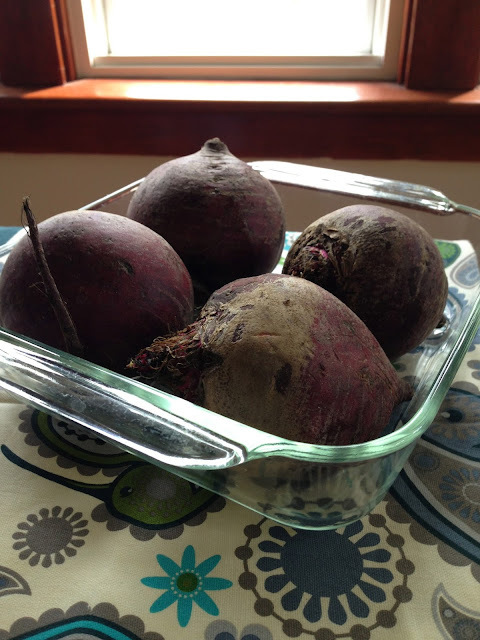 Put the beets in a baking dish with a bit of water in the bottom, cover with foil, and bake for 30-60 minutes depending on the size. They are done when a skewer can be inserted all the way through with no resistance. This is the crucial part if you don't like beets because under-cooked beets have a much stronger flavour than tender ones. When the beets are finished cooking, peel them, slice them into wedges, and set them aside. 2. In a heavy dry pan, toast the pumpkin seeds over medium heat until puffed and slightly brown. Remove them from the heat and mix with a tiny bit of olive oil and salt. Set aside. 3. Whisk together the olive oil, sea salt, red wine vinegar, honey, and red onions. Pour the vinaigrette over the cooked beets and marinate in the refrigerator for 2-12 hours. If you leave them in for longer, it's fine (this is actually a very good recipe to make ahead), but the olive oil might solidify a bit in the fridge. If that happens, just let it warm up at room temperature until it melts again. 4. 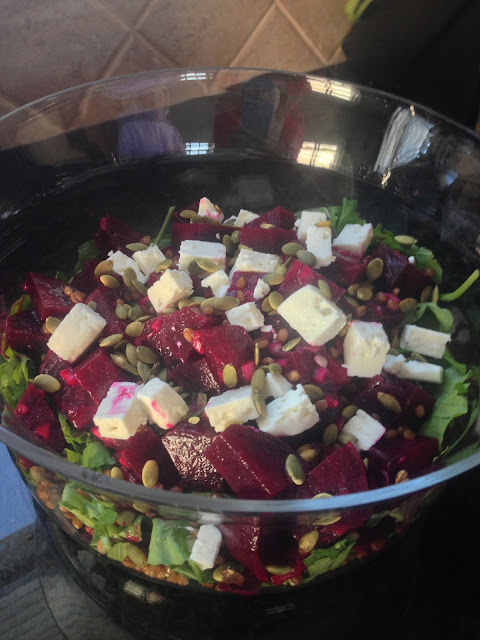 In a bowl or on a plate, spread the mixed greens around, top with the drained beets, feta, and toasted pumpkin seeds. Drizzle some of the remaining vinaigrette over top. 1. I really like to include cooked wheat berries into this recipe. They have a nice nutty chew and make it a more substantial recipe. 1. If you keep the beet mixture separate from the greens, feta, and pumpkin seeds, this salad will last a few days in the fridge. 1. If you buy your beets at the store, you will probably only have the choice of red beets. But if you are at the farmers market, you will probably have the choice of golden yellow beets as well. This salad is great with a mix of both, and I actually prefer the yellow ones because I find them milder in flavour - perfect for someone who thinks they don't like beets! 2. Your beets might come with or without greens on top. If they come with the greens, cut them off before roasting them, leaving about 1/2 inch of the stem attached to the beet. The greens are edible and tasty, so you might want to fry them up in a pan. That's it! Easy, peasy. I hope I've convinced you that beets aren't that bad and maybe this salad will make it into your winter rotation as well as your fall one! Enjoy! By the way, when are the fall soup recipes coming? The fresh harvest and cooler days are perfect for soups and Dad and I love to make a meal of them... several times over! This salad was amazing! When I think of beets, I remember the harsh pickled ones from my childhood. These beets are nothing like that and have made a convert out of me! Keep it up. That's why I like it with the wheat berries. 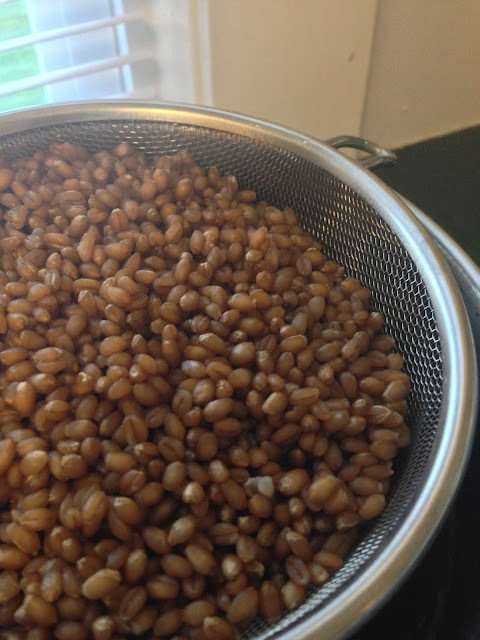 Sometimes I substitute the wheat berries for the grains. Keep cooking the beets until they are soft. Sometimes it takes longer.